Have you ever thought of what would happen to our world if we ever turned our backs on everyone? The beginning of the Divergent is just what you would imagine: a city that has been torn apart by a war, and one that left the city in distress. In the world of Divergent, the human population’s sense of control is different than our own. However, how the control is kept depends on which faction is in control. Factions are societal divisions that classify citizens based on their aptitudes and values. The city is divided into five factions: Abnegation, Erudite, Dauntless, Amity and Candor. Abnegations are those who are selfless; they put others needs before their own. Erudites are the intelligent ones; they proclaim to be the knowledgeable ones. Dauntless are the brave ones; they are the soldiers of the city. Amity members are the peaceful ones; they are the caretakers of the land. Candor members are honest; they tend to say exactly what is on their mind. Also, there are the factionless. They failed to get into the faction they chose, and they now live on the streets in destitution. Lastly, there are a few citizens that are divergent. A divergent cannot be just one faction because they are more open-minded and cannot force themselves to be just one thing. The movie follows Tris Prior (Shailene Woodley) as she decides which faction she wants to be in for the rest of her life; once you join a faction, you can’t ever transfer. She decides to leave her birth faction, Abnegation, for Dauntless. From the beginning, she realizes Dauntless is very different from what she had always known. The journey she takes to get to initiation is a tough one, but it has its rewarding moments. After she officially becomes a member of Dauntless, she and Four (Theo James) are faced with a big problem: they are both divergent. They then learn of a plan that Jeanine Matthews (Kate Winslet) and the Erudite faction has set up with Dauntless and are forced to try and stop it. After they stop a major part of the plan, the movie ends, and that is where Insurgent will pick up. Insurgent is the second movie based on the Divergent trilogy by Veronica Roth, and its release date for theaters was March 20. 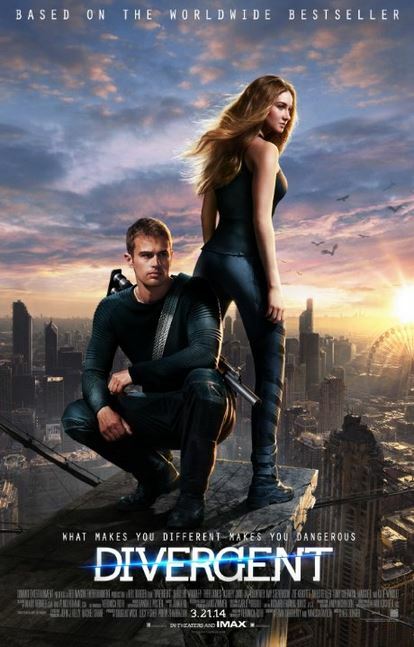 The main characters are Tris Prior, Four Jeanine Matthews and Caleb Prior (Ansel Elgort). The actors and actresses of whom producer and director choose portrays the characters flawlessly. I do not think they could have found better actors. Also, the amount of details they put into each scene is astonishing. Everything is just the way it should be and then some. Divergent went into theaters on March 21, 2014 and came out on DVD on Aug. 5. I definitely recommend this movie, especially if you are a science fiction fan. Also, if you are planning to see Insurgent in theaters, I recommend you re-watch Divergent. It will help refresh anything you don’t remember in the last movie before you see the new one. If Insurgent is anything like Divergent, it is sure to be one of the best movies of 2015.